Inside the March issue you will find, a newcomer's guide to Crufts, dog-friendly breaks with a difference, and advice on how to manage an allergic dog. 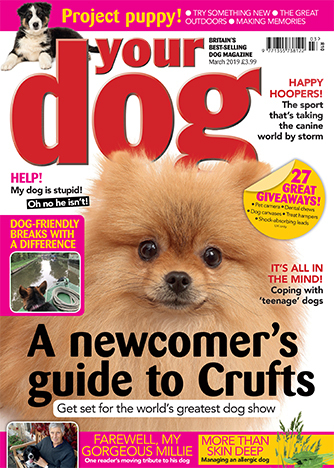 Plus, the sport that's taking the canine world by storm, how to cope with 'teenage' dogs, working on your communication with your dog, and 27 fantastic giveaways for you and your dog! We’re looking forward to meeting some of our readers at the world’s greatest dog show later this month (Crufts, of course!). If you are visiting the show, held at the NEC in Birmingham, don’t forget to pop over to the Your Dog stand to say hello. You’ll find us in hall 4, stand 32. For those of you who’ll be watching the action at home, you can tap into a little bit of that Crufts magic by checking out our special feature this month. See page 10 for more details, and to start getting into the Crufts spirit. We’ve got lots of uplifting features for you this issue — from some inspirational holiday options (go on, dare to be different — see page 26) to an introduction to the dog sport that’s going down a storm in the UK — hoopers (see page 52). On a sadder note, losing a much-loved pet is the downside of dog ownership. Our vet, Vicky Payne, explores the painful decisions dog owners have to make — often with the help of their vet (see page 18) — while our bereavement article, on page 56, includes advice on understanding grief and remembering your dog, and a moving tribute to a very special spaniel. Finally, this is the last part in our Project Puppy series. It’s been a delight following the escapades of Bodie at The Smiling Sheep, and I wish owner Holly success with her agility training. It’s also been great to see your photos in our Puppy Gallery. Puppies grow up all too quickly, so having a collection of photos is always a lovely reminder of the way things were — and it’s even better when they’ve appeared in print in your favourite magazine!